Movie star Niven’s 1971 memoir is certainly “chirpy.” And if you’re a fan of old Hollywood, it’s guaranteed to make you smile. But Balloon also reminded me of – of all books – a more recent “memoir”: controversial author James Frey’s A Million Little Pieces. I read Frey’s bestseller after it was revealed that much of his allegedly true story was pure fiction. But I liked it anyway. 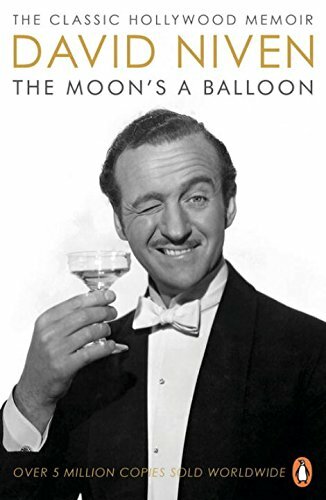 In Niven’s case, later biographers have debunked many of the anecdotes he relates in The Moon’s a Balloon as either exaggerated, sugar-coated, or outright fabrications. But I liked it anyway. It’s odd, though. So much of Niven’s life was so inherently interesting – World War II service, Hollywood stardom, glamorous pals – that you have to wonder why he felt the need to embellish. My guess is that the above quote explains at least part of it. Niven was a born entertainer, and if that meant stretching the truth a bit, so be it. Or maybe he was just practicing what Hollywood preached in its “golden age”: Life goes down better with a happy ending.